A toner for developing an electrostatic latent image, comprising a colorant, a releasing agent and a binder resin, wherein said binder resin comprises a first, non-linear resin, a second, linear resin, and a modified wax comprising a wax moiety and a vinyl polymer moiety having an ester group content of 8 to 30% by weight based on the weight of the vinyl polymer moiety. FIG. 2 is a cross-sectional view diagrammatically illustrating an image forming apparatus used to carry out an image forming method according to the present invention. The term “softening point” as used herein is intended to refer to F 1/2 temperature measured in accordance with JIS K72101 using a commercially available flow tester of capillary type, “CFT-500” (Trademark), made by Shimadzu Corporation. A sample of the resin (1 cm3) is placed in a cylinder of the tester provided with a small orifice with a diameter of 1 mm. The temperature of the sample is increased at a rate of 6° C./min while applying a pressure of 20 kg/cm2 to the resin sample to permit the resin sample to flow out through orifice. The height of the sample resin in the cylinder, which decreases as the resin flows through the orifice, is plotted against the temperature. The temperature at which the height of the resin sample in the cylinder has decreased to ½ of the original height (½ of the height from the flow-out initiation point to the flow-out completion point) represents the softening point of the sample resin. 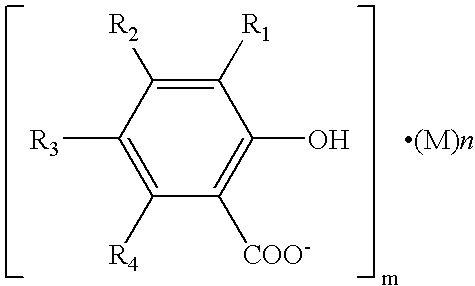 wherein R 1, R2, R3 and R4 independently represent a hydrogen atom, an alkyl group having 1 to 18 carbon atoms or an allyl group, wherein R1 and R2, R2 and R3, or R3 and R4 optionally share a bond connectivity to form an aromatic or aliphatic group optionally having a substituent; M represents a metal; and m is an integer not less than 3 and n is an integer not less than 2. All metals having a valence of at least 3 can be used as the center metal M. Among the metals, Fe, Ni, Al, Ti, and Zr are preferable, and Fe is the most preferable in view of safety. The use of the salicylic acid metal compound in conjunction with the non-linear resin having a hydroxyl value of at least 20 mgKOH/g is especially preferable, because of improved hot offset resistance. Probably, the salicylic acid metal compound can bond to the non-linear resin to form cross-linkages. In the present specification, the molecular weight distribution of a resin is measured by gel permeation chromatorgraphy (GPC). The gel permeation chromatography is performed as follows: A column is stabilized in a chamber heated to 40° C., through which THF is allowed to flow at a flowing speed of 1 ml/min. Then, 50 to 200 μl of a THF solution of a sample to be measured having a concentration of from 0.05 to 0.6% by weight, is injected into the column with a syringe having a tip end to which a filter unit is connected. Elution is then started to determine the molecular distribution of the sample. Similar operations are performed with respect to several standard polystyrene resins, which have different molecular weights and each of which has a single molecular weight, to prepare a calibration curve. It is preferable to use at least about ten standard polystyrenes to prepare the calibration curve. Polystyrenes having a molecular weight of 6×10 2, 2.1×103, 4×103, 1.75×104, 5.1×104, 1.1×105, 3.9×105, 8.6×105, 2×106, and 4.48×106 which are manufactured by Pressure Chemical Co., or Tosoh Corp. are exemplified as the standard polystyrenes. As a detector, RI is used. The “content of toner particles having a circle-equivalent diameter of not smaller than 0.60 μm but less than 3 μm” and the “sphericity” as used herein is measured using a flow particle image analyzer, “FPIA-2100”, manufactured by SYSMEX Co., Ltd.). A 1% NaCl aqueous solution (50 to 100 ml) after being passed through a 0.45 μm filter is mixed with 0.1 to 5 ml of a surfactant (preferably a salt of alkylbenzenesulfonate). To the resulting solution, 1 to 10 mg of a sample is added. This is subjected to a dispersion treatment for 1 minute with an ultrasonic disperser to form a sample dispersion liquid having a concentration of 5000 to 15000 particles/μl. The sample dispersion liquid is measured for the average sphericity of particles having a circle-equivalent diameter of not smaller than 0.60 μm using the above flow type particle image analyzer. From the area of the two-dimensional image of each of the particles measured with a CCD camera, a diameter of a circle having the same area is calculated as a circle-equivalent diameter of the particle. The average sphericity is calculated by dividing a sum of the circle-equivalent diameters of the particles by the number of the particles as follows. wherein L 0 represents a spherical length of a circle having the same area as the projected area of a toner particle and L represents a peripheral length of the projected image of the toner particle. The sphericity provides an index for evaluating the shape of a toner particle. The closer the shape of the toner to a true circle, the nearer becomes the sphericity to 1. As the shape becomes complicated, the sphericity becomes smaller. In the electrophotographic apparatus of FIG. 2, a cylindrically shaped photoconductor or photoreceptor  1 as an image bearing member is supported so as to rotate in the direction (counterclockwise) indicated by an arrow. Arranged around the photoreceptor 1, are a charging roller 2, an exposing device 3, a developing device 4, a transfer belt 6, a cleaning blade 7, a rotary blade 8, and a toner returning coil 9. The above-described elements except the transfer belt 6 are housed in a photoreceptor/cleaning unit 10. The developing device  4 is housed in a case having an opening in which a developing sleeve 5 is rotatably supported and disposed opposite the surface of the photoreceptor 1. A paddle 14 is rotatably supported and disposed in the case at the position opposite the developing sleeve 5. In the paddle 14, a screw conveyor 13 is provided and supported such that the screw conveyor 13 rotates in the same direction as the paddle 14. The thus constructed electrophotographic apparatus operates as follows. After the photoreceptor  1 is uniformly charged by the charging roller 2, the exposing device 3 exposes the surface of the photoreceptor 1 to form an electrostatic latent image on the photoreceptor 1. In the developing device 4, a two-component developer T is contained. The two-component developer T is a mixture of a carrier and a toner according to the present invention. When the developer T is agitated by the paddle 14, the toner is charged by friction. The developer T including the charged toner is attracted to the developing sleeve 5 and is conveyed as the developing sleeve 5 rotates. Subsequently, the toner on the developing sleeve 5 is transferred to the surface of the photoreceptor 1 at the position where the developing sleeve 5 faces the photoreceptor 1 so that the electrostatic latent image on the photoreceptor 1 is developed with toner to form a toner image on the photoreceptor 1. A voltage of opposite polarity to that of toner is applied to the transfer belt 6 through a bias roller 6 a by a power source (not shown). A transfer sheet S is supplied from a feeding device (not shown) and is fed by resist rollers 18 to a transfer station (nip) between the photoreceptor 1 and the transfer belt 6, where the toner image on the photoreceptor 1 is transferred to the transfer sheet S by an electric field generated at the transfer station. Subsequently, the transfer sheet with the toner image is conveyed to a fixing device (not shown) by the transfer belt 6. The toner image is fused on the transfer sheet while passing through the fixing device. The toner which is not transferred to the transfer sheet and remains on the photoreceptor 1 is removed by the cleaning blade 7 and is then guided to the toner returning coil 9 by the rotary blade 8. Subsequently, the toner is returned to the developing device 4 as a recycled toner by the toner returning coil 9. Charges on the photoreceptor 1 cleaned by the cleaning blade 7 are removed by a lamp 20. 1. A toner for developing an electrostatic latent image, comprising a colorant, a releasing agent and a binder resin, wherein said binder resin comprises a first, non-linear resin, a second, linear resin, and a modified wax comprising a wax moiety and a vinyl polymer moiety having an ester group content of 8 to 30% by weight based on the weight of the vinyl polymer moiety. 2. A toner as claimed in claim 1, wherein said modified wax is present in an amount of 3 to 20 parts by weight per 100 parts by weight of said binder resin. 3. A toner as claimed in claim 1, wherein said releasing agent is selected from the group consisting of carnauba wax, montan wax, polyolefin wax, oxidized rice wax and synthetic polyester wax. 4. A toner as claimed in claim 1, wherein said releasing agent is present in an amount of 2 to 10 parts by weight per 100 parts by weight of said binder resin. 5. A toner as claimed in claim 1, wherein the weight ratio of said modified wax to said releasing agent ranges from 1:2 to 3:1. 7. A toner as claimed in claim 1, wherein the weight ratio of said wax moiety to said vinyl polymer moiety is in the range of 1:100 to 45:100. 8. A toner as claimed in claim 1, wherein said wax moiety comprises a polyolefin chain. 9. A toner as claimed in claim 1, wherein said vinyl polymer moiety has a glass transition temperature of 40 to 90° C.
10. A toner as claimed in claim 1, wherein said binder resin further comprises a third, hybrid resin including a first polymer unit obtainable by condensation polymerization, and a second polymer unit connected to said first polymer unit and obtainable by addition polymerization. 11. A toner as claimed in claim 10, wherein each of said first resin, second resin and third resin comprises a polyester unit. TM1>TM3>TM2−10° C.<(TG1−TG2)<10° C.30° C.≦(TM1−TM2)≦60° C.
13. A toner as claimed in claim 1, wherein said first resin has an acid value of 20 to 70 mg KOH/g. 14. A toner as claimed in claim 1, wherein said second resin has an acid value of 7 to 70 mg KOH/g. 15. A toner as claimed in claim 1, further comprising a metal compound of salicylic acid, said metal having at least 3 valence. 16. A toner as claimed in claim 15, wherein said salicylic acid metal compound is present in an amount of from 0.05 to 10 parts by weight per 100 parts by weight of said binder resin. 17. A toner as claimed in claim 1, wherein said first resin has a hydroxyl value of at least 20 mgKOH/g. 18. A toner as claimed in claim 1, wherein said binder resin contains tetrahydrofuran solubles having such a molecular weight distribution according to gel permeation chromatography that at least one peak having a half value width of not greater than 15,000 is present in a molecular weight region of 1,000 to 10,000. 19. A toner as claimed in claim 1, and having chloroform insolubles in an amount of 5 to 40% by weight based on the weight of said binder resin. 20. A toner as claimed in claim 1, and providing a coefficient of static friction of at least 0.20 when press-molded into a plate. 21. A toner as claimed in claim 1, and having such a particle diameter distribution that the weight average particle diameter ranges from 4 to 7.5 μm and that 60 to 80% by number thereof has a particle diameter of 5 μm or less. 22. A toner as claimed in claim 1, and having a content of particles having a circle-equivalent diameter of not smaller than 0.60 μm but smaller than 3 μm of 25% or less. 23. A toner as claimed in claim 1, and having circularity of 0.91 to 0.96. 24. A toner as claimed in claim 1, wherein said modified wax forms domains dispersed in a matrix of said first and second resins with said releasing agent being contained in said modified wax domains. 25. A toner as claimed in claim 1, wherein each of said first and second resins contains at least 50 mole % of ester units, based on a total moles of the monomer units constituting respective non-linear resin and linear resins. 26. A toner cartridge containing a toner according to claim 1. 27. A two-component developer comprising a toner according to claim 1, and a carrier. 28. A cartridge containing a two-component developer according to claim 27. 29. An image forming method, comprising developing an electrostatic latent image on an latent image-bearing member with a toner according to claim 1. 30. An image forming apparatus comprising an latent image-bearing member, and a developing unit containing a toner according to claim 1 and configured to develop the electrostatic latent image on said latent image-bearing member with said toner.